When I was a child, I was fascinated by the Olympic Games. Normally we do not watch sports, but it's totally different Olympic season. 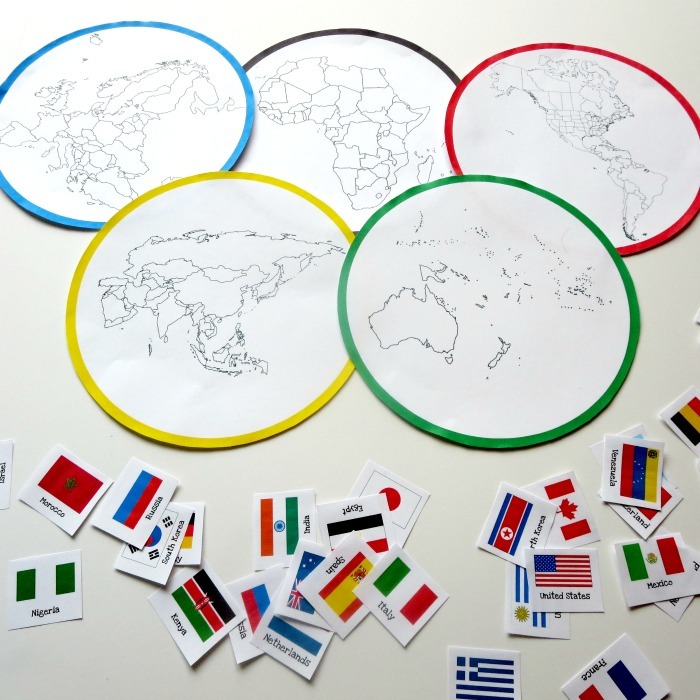 Not only one can learn a lot of life lessons from watching Olympics, but kids and adults can extend their knowledge of countries and cultures of the world. Which countries took part in the first modern Olympic Games? Who won the first gold (silver, actually) modern Olympic medal? "Hitler Olympic" of 1936 in Berlin. Munich Olympic massacre of 1972 and subsequent hunt for Black September. "Cold war medal struggle" between USA and Soviet Union. 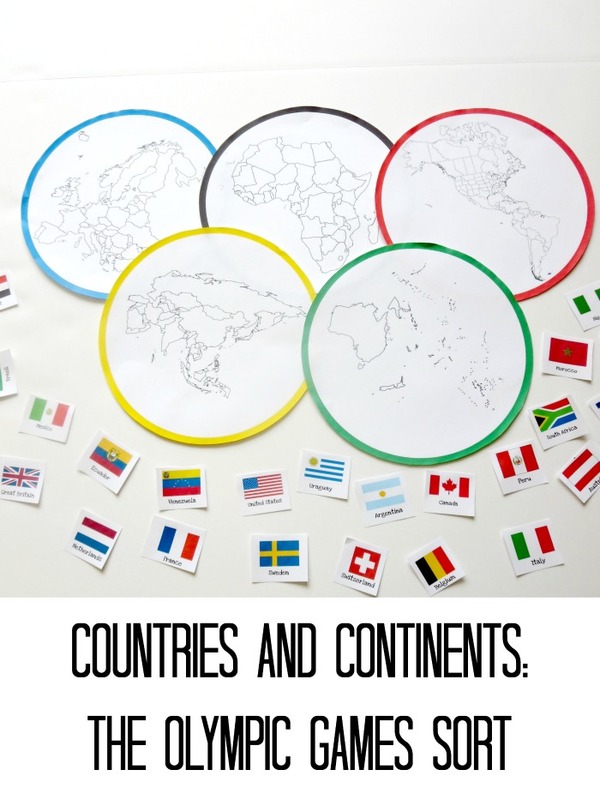 Which country hosted Olympic Games most often? Who was the most decorated Olympian ever? 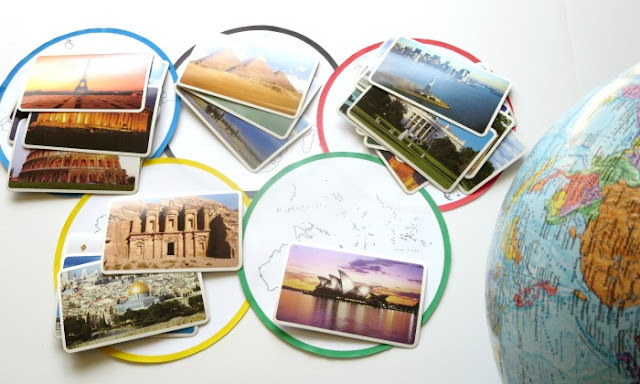 Which city hosted most Olympic Games? 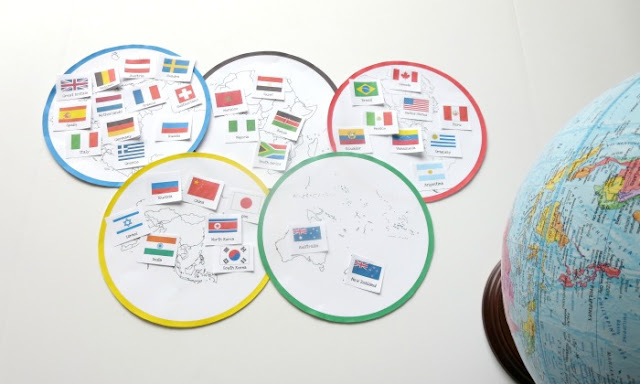 Yesterday I shared a free printable related to the story of Olympic rings and promised to tell how you can use it in learning games. 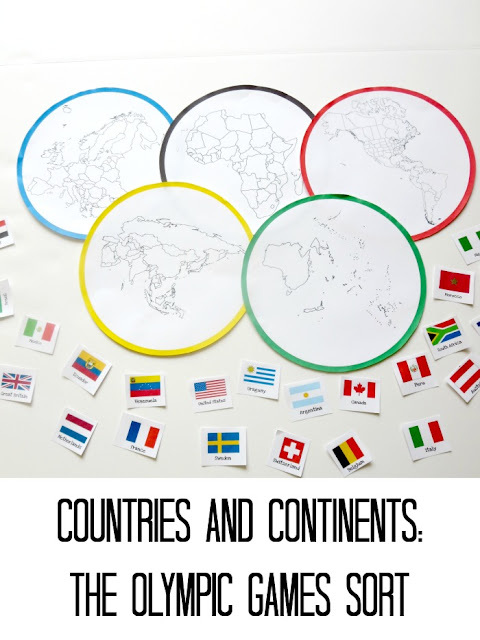 Here is the first option - combine this printable with free printable flags of the world from Homeschool Creations and sort countries into their continents. Smarty used the globe trying to find "tricky" countries. By the way, Russia is not the only transcontinental country in the world, but the flag set did not have flags for Turkey or Kazakhstan. It also had only one flag for Egypt, which is also a transcontinental country on the divide between Africa and Asia. For this game we used a set of "Landmarks of the World" that I got in $1 section of Target some time ago. Poor Australia ended up with one card. Actually, the set had Uluru as well for Australia, but we used it previously in another project. It was a fun way to reconnect to all those fantastic places in the world and discuss which ones we will have a chance to visit reasonably soon and which ones are in "maybe one day" category. Are your kids excited about the Olympic Games 2016? Once upon a time I think we too had that landmark set, but it got lost to the ravages of time, or the blackhole that is my house. Take your pick. I LOVE this activity, and think it's such a great idea. I love the country and landmark sorting games! We have those same cards. When I was teaching 5th & 6th grade I had a bulletin board by my door where I'd post one card a week for kids to guess the continent and country. It was fun to listen in on the discussion they had about it as we lined up to leave the classroom. 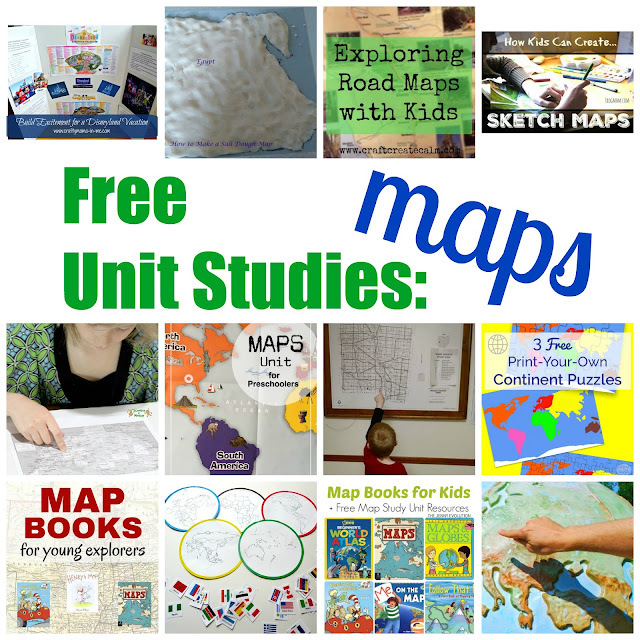 If you have a chance, this would be a great post to link up to the #EverythingKids pin & link party - the only requirement there is 3 repins. I always love your creative ideas, Natalie.